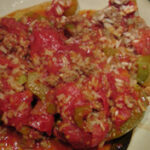 Stuffed peppers is one of my all-time favorite dinners. My mom, who was an awesome cook, used to make them often. I’ve added a few finishing touches of my own in this recipe. For example, I add fresh tomatoes to the mix of 95% lean ground beef and a blend of white and brown rice… plus a few other minor adjustments. This recipe serves 2 to 3, depending on your appetite! Put the lean ground beef into a pan to brown. Add pepper and garlic powder to taste (don’t overdo the garlic). Cook the beef, chunk it as you go, until the pink is gone. Drain and put in a mixing bowl. Add partially cooked rice (or leftover rice) to the bowl, add the chopped onion and garlic clove, and one of the diced tomatoes to the mixture. Mix well but don’t break up the meat too much. Stuff the meat and rice mixture into halved bell peppers. Place in a skillet with good sides, pour in the tomato juice until it comes up about an half inch from the top of the peppers. Bring to a soft boil, turn the heat down, cover and simmer for 45 minutes to an hour. In the last 15 minutes of cooking add the second chopped tomato into the juice. Mix the raw lean ground beef with uncooked rice, seasonings and chopped veggies. Stuff the whole bell pepper. Place the peppers in your pan and pour in the tomato juice until it’s just below the top of the bell peppers. Bring to a soft boil, lower the heat, cover and simmer 1-1/2 hours. Watch to make sure the bottom of the bells don’t burn. Move them around with a large spoon once in a while throughout cooking. You can easily replace ground beef with ground turkey, tofu or even eggplant. Brown rice is much healthier but not everyone likes it. Try 50/50 brown and white mixed if you prefer white. My mom used white rice only but we mix it with brown for the added health benefit. You could cook this dinner in a crock pot on low while you’re away for the day!